Everton forward Theo Walcott has admitted he "fell out of love with football" in the final stage of his career at former club Arsenal. 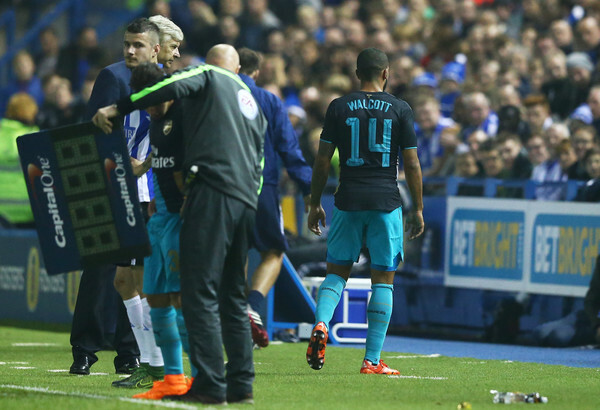 First half substitute Theo Walcott of Arsenal comes off injured after coming on to replace Alex Oxlade-Chamberlain of Arsenal during the Capital One Cup fourth round match between Sheffield Wednesday and Arsenal at Hillsborough Stadium on October 27, 2015 in Sheffield, England. The 29-year-old left Arsenal to join Everton in the January transfer window, bringing an end to 12 years with the North London club, where he scored 108 goals in 397 appearances. And Walcott has explained in an interview with Sky Sports that his lack of playing time towards the end of his Arsenal career was causing him to fall out of love with the game. I'm not going to lie, I fell out of love with football for a little bit. Because I had some good performances, but then just didn't get the chance to play on. Scoring over 100 goals for Arsenal is a great achievement for me personally, and then just the last year-and-a-half was tough, I can't lie. It was really tough, not being able to get into the team, being in and out. I just felt I wanted to get the excitement of football again. I didn't feel like it was going to be at Arsenal then. Walcott has made a good start to life on Merseyside and had a great start to the season, scoring two goals in two games against Huddersfield Town and Bournemouth. I got the buzz and enjoyment back, and I couldn't be in a happier place to be honest, I'm playing football with a smile on my face. I just love football again.